Contents: Sections 1: Characterization and Physical Properties of YBa2Cu3O7-x, Y2Ba4Cu7O15+x and YBa2Cu4O8. The high-Tc superconducting phases of the Y2Ba4Cu6+nO14+n family (J. Karpinski et al.). Pressure dependence of Tc and anisotropic features in the family Y2Ba4Cu6+nO14+n (n=0,1,2) (B. Bucher et al.). YBa2Cu4O8: A strong coupling high-Tc superconductor? (J. Schoenes et al.). Pressure-induced structural and electronic properties of high-Tc superconducting materials studied by neutron scattering (J. Mesot et al.). 2. Crystal Growth and Defects in Y-Ba-Cu-O Phases. Magnetic properties of mm-sized YBa2Cu3O7-x single crystals (K. Schönmann et al.). Vacancy behaviour and hole numbers in YBa2Cu3O7-x (C. Calandra, T. Minerva). 3. Thin Films and Thick Films of Y-Ba-Cu-O Phases; Multilayers. Pulsed laser deposition of high-Tc superconductor films in the ultraviolet, visible, and near-infrared range (W. Kautek et al.). Deposition of large area YBa2Cu3O7-&dgr; thin films bymagnetron sputtering (G. Wagner, H.U. Habermeier). Preparation of YBaCuO superconducting coatings by thermal spraying (J. Lacombe et al.). 4. Bi-Cuprates, Bulk. Phase diagram studies in the Bi(Pb)-Sr-Ca-Cu-O system (P. Strobel, T. Fournier). Something new and something old on the phases in the superconducting systems (I. Vasilyeva et al.). Weldability of Bi-based superconductor and flame welding method (Li Biaorong et al.). 5. Bi-Cuprates, Thin and Thick Films. Electron-beam evaporation and interface characterization of Bi2Sr2Ca1Cu2Oy thin films on SrTiO3- and Si-substrates (V. Klocke et al.). Hyper-diamagnetism in superconducting Bi(Pb)-Ca-Sr-Cu-O thick films (J. Hagberg et al.). Part B. Section 6. n-Doped High-Tc Compounds, La-Cuprates, Other High-Tc-Materials. Electronic structure of p-type and n-type cuprate superconductors (S. Uchida et al.). Field-induced transformations of the spin ordering in Nd2CuO4 (D. Petitgrand et al.). Transport and magnetic properties versus hole doping in (La,Nd)2NiO4+&dgr; (X. Granados et al.). Phase conversion in La2CuO4 superconductors (J.C. Park et al.). Characterization of sputtered films of Ti-Ba-Ca-Cu-O (J. Chrzanowski et al.). Investigations of the electronic structure of cuprate superconductors by high-energy spectroscopy (J. Flink et al.). Thermopower of superconducting YBa2Cu3O7&dgr; thin films (E.B. Lopes et al.). The mixed state of RBaCuO ceramic superconductors (Yu.V. Bugoslavski, A.A. Minakov). SNMS studies of high temperature superconductor films on silicon (U. Breuer et al.). A method to determine the orientation of superconductor surfaces and thin layers (P.V. Huong). Microwave characterization of high-Tc superconductors with a dielectric resonator (O. Llopis, J. Graffeuil). 8. Pinning, Relation of Microstructure and Properties. Observation of the flux line lattice in high-Tc superconductors (L.Ya. Vinnikov et al.). Investigation of grain boundaries using microcontacts (G. Schindler et al.). Fundamental and contingent parameters in the description of transport properties of high-Tc oxides (A. Raboutou et al.). 9. Theoretical Models. Theories of high-Tc superconductivity. What have we learned in 3 years? (T.M. Rice). 10. Applications. 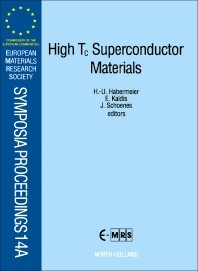 Microbridges in high-Tc superconductors: High IcRn products (Z.G. Ivanov et al.). Structuring HTC-films by electron beam lithography (W. Albrecht et al.). Author. Index. The dynamic developments in high-temperature superconductivity over the last three years has augmented the importance of materials research not only for applications, but also for the understanding of underlying physical phenomena. The discovery of new superconductors has opened up new facets of High Tc research, and the perfection of already known materials has enabled reliable physical measurements to be carried out, providing a foundation for theoretical models. The papers in this volume present an overview of the recent developments in the field of High Tc-materials research. One of the highlights of this meeting was the plenary lecture by the Nobel laureate K. Alex Müller on the importance of the apical oxygen phenomena which are strongly connected with Tc changes.